Dearest Blog: Today it was off to Marquee Cinemas for Star Trek Beyond. Spoiler level here will be mild, nothing you wouldn't know from the trailers. Midway through a five-year mission to deep space, the Enterprise crew is called upon to save the world(s) from a ruthless enemy. While I'm a casual fan of Star Trek in general, I'm positively rabid over the current film franchise, which boasts my favorite cast of any series and movies that I'll happily watch over and over and over again. I am pleased to report that Beyond does not miss a step on the path of excellence set by the first two movies. First we have the ensemble, for my money, Hollywood's very finest. Every person is ideally suited to his or her role, and consistently turns in sincere, entertaining performances. The more comical tone of the current installment fits co-writer Simon Pegg, Chris Pine, and Karl Urban to a "T," and the picture is not short on laugh-out-loud moments. The sad losses of Leonard Nimoy and Anton Yelchin since the previous film cast a bit of a pall over the experience, but that is in no way the movie's fault. Bring the tissues, though. You're gonna need them at least once. Franchise newcomers Sofia Boutella and Idris Elba are both fantastic. Michael Giacchino's lovely score is the perfect accompaniment to moments both large and small. Nice-looking sets underscore some great big effects, and the Enterprise's first appearance is, as always, a chill-inducing moment. Under director Justin Lin's hand, we get a more action-oriented movie this time out (insert Fast & Furious joke here), so the film does feel a bit more like a plain old action-comedy than any great step forward for the Trek universe, but thanks to an edge-of-your-seat story, genuine, well-written dialogue, and the cast's terrific chemistry, you're never less than fully immersed. A few small quibbles: the movie's a little too heavy on the jiggly camera work, some scenes are impossibly dark (a by-product of seeing a 3D picture in 2D? ), and whatever they were thinking when they cast Idris Elba as a character who doesn't look like Idris Elba, well, it was clearly misguided. Star Trek Beyond clocks in at 120 minutes and is rated PG13 for "sequences of sci-fi action and violence." 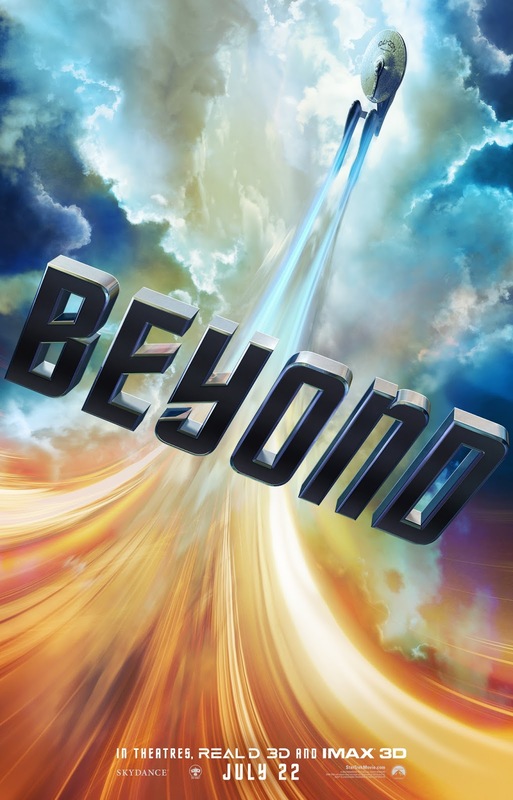 A big, fun summer blockbuster that also delivers a great message about the importance of love and friendship, Star Trek Beyond has a lot to love for Trek die-hards, casual fans, and even folks without so much as a passing familiarity with the franchise. Of a possible nine Weasleys, Star Trek Beyond gets eight and a half. Fangirl points: Idris Elba. Did I mention Idris Elba? Because...yeah...Idris Elba.